I saw you with: I've seen you a few times around town, most recently at Sante with two other gals and a guy having drinks. 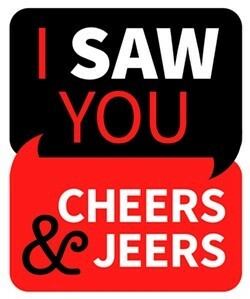 Interestingly, I saw you reading the Inlander and reading (I think) the "I saw you" column! Blonde hair, great laugh, tallish for a woman - maybe one day I'll be brave enough to actually say hello! You insisted to purchase my groceries at Safeway: to the lovely maroon haired girl who insisted to buy my groceries at the checkout. That was a very lovely gesture and your generosity is your reward in heaven. Bless you for being so sweet and receptive, it's only matched by your beauty.. maybe someday our paths will meet again. Dollar Store Dream: We spent the early part of this week with the kiddos, shopping at the dollar store. I love that we dont have to spend a fortune to have fun and to enjoy the company of eachother and the kiddos. I love you more. Urban Cowboy: Cheers to Dan Nailen for a spot on review of the 1980 film! As I read his take on the film, the memories rained down like Mt. St. Helens ash... although his opening sentence stating America was confused to me didn't ring accurate. It was a different time then, and we had a Congress that was actually committed to getting things accomplished unlike today's. Carter and Reagan didn't sling mud and insults at each other, just agreed to disagree - How Refreshing! I was 15 at the time and would rather eat kale than listen to country music, but the movie was so packed with socially acceptable tunes (I could now say I loved Devil Goes Down to Georgia to fit in) Debra Winger was hot, but I drooled over the sultry Houston brunette socialite that Bud sleeps with in her high rise condo to get back at spoiled wife Sissy! YES! As icing on the cake, I was babysitting for my sister and husband who lived in Cheney and while her and hubby were out; I found a bottle of brandy and began to guzzle while watching said film. I somehow managed to watch it all, when lo and behold she came home and found me passed out on the living room floor in front of the TV...ahhh the memories! Trash on the CDA freeway: I want to say thank you to the gentleman that I saw in CDA by NW BLVD! It was 7am and he had a garbage can strapped to his back, he was walking on the N side of the freeway picking up all the trash that careless people throw out. We need more good people like you in this world. I hope you see this because you deserve to know that you are very much appreciated!! The world is full of good people, if you can't find one- BE ONE!! Crosswalks aren't Optional: You clearly saw me crossing. I was halfway across, the other cars STOPPED. But you? You kept coasting and actually sped up when you saw me. And why? You were on your damn phone. If nobody told you, you are not supposed to have your phone in hand when the vehicle is in motion. Granted, I know the crosswalk laws; if I was still on the sidewalk then no, you don't have to stop. But if a person(s) is on the road and showing they are crossing (RCW 46.61.240), then you have to stop. I felt the wind of your vehicle hit me. You came within an inch of hitting me. And the speed that you were going, I wouldn't have gotten up without injury. Slow down, pay attention, and get off your bloody phone. You are going to hurt someone or even get them killed with your reckless driving. Your text can wait. I do not want to see ANYONE become a statistic because f your distracted driving. Please put your phone up and watch the road better, pull over if you must answer but whatever message you have can wait until you are safe and able to talk. The next time, neither of us might be so lucky to escape without injury or worse. Stealing my cellphone was not cool: I was at the AMC theater in downtown Spokane April 15 in the afternoon watching a movie. When I went to the restroom during the movie and left my jacket on my seat not realizing I left my phone in it. I didn't bother trying to use my phone until after I left the theater and realized it was gone. You were two teenage females who ended up sitting next to me ten minutes after the movie started. My cell phone was a a three year old android ZTE pay as you go. It has no monetary value but does contain lots of photos of my pets and relatives which was irreplaceable. Do the right thing and turn the phone into the AMC customer service. Prove to me that you are decent humans and not sociopaths destined to have karma nipping at your heels at every turn in life.